The new season starts off with some action against our favorite Rogues. The Flash stops them, with a little help from Firestorm, and the two return to Star Labs. Greeted and congratulated on the success, all seems great and then Eddie pats Barry on the back and the dread comes. It’s sad and reality sets in. His monologue introduction reveals the last six months he’s been a solo act, so where has everyone gone? Cisco became a consultant at the CCPD for the Meta Human Task Force. Caitlin is working with … McGee at Mercury Labs. We can assume Dr. Stein is teaching again, maybe writing a book, or just enjoying retired life; whatever he’s doing, he’s still in Central City. Joe is still the detective and Iris is still at the paper. Flash Day, a day to Honor the Man who Saved Central City, is just around the bend and it’s the talk of the town. Barry’s guilt deprives him of any positive things this event has for him. He’s been working himself ragged at work in the crime lab, saving people, and fixing the city to be what it was. Everyone has tried to give him space to let him grieve, but it’s been six months, he needs his friends and family, he needs this event held in his honor, he needs to live again. 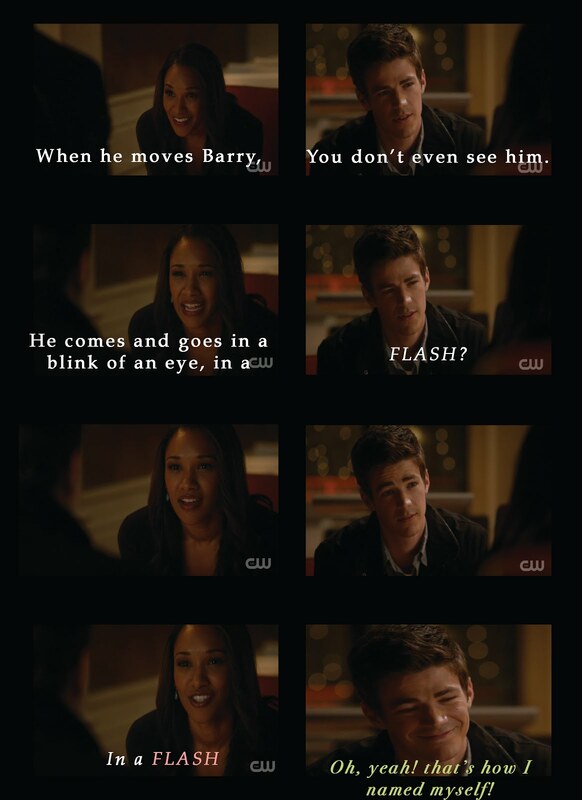 Iris talks to Barry, she reminds him that the City believes in him and he gives them Hope. I believe Barry planned not to be on stage, but went to make sure nothing bad happens. That is, until he hears the speech, “The Flash doesn’t just protect us, he restores Hope where it was lost.” The cheers, and then the silence… the Hope, of their hero coming, was disappearing… He couldn’t let them down. Then the Atom Smasher, so awesomely named by none other than Martin Stein, Came. Big and brooding, he crashes the Celebration… Literally. We see a little bit of Cisco’s powers, as he zones out for a moment. Atom Smasher’s size growth is too rubbery and cartoon this first time, and I honestly don’t like it, but later in the episode, his growth is depicted more realistic visually. Most of Team Flash has decided to stop letting Barry push them away and work on solving the Atom Smasher problem, whether Barry likes it or not. The Flash runs head strong in to a battle with Atom Smasher and with the help of Cisco and Prof. Stein he makes it out barely alive. We watch a Back Flash heart to heart between Joe and Barry, followed by a present day Heart to heart between the same two. Joe explains, yes the singularity was his fault, but he didn’t act alone. Everyone made choices that day… I personally disagree with this. Barry went back in time didn’t change anything and had peace of mind coming back to the family he had and didn’t want that to change. The portal closed and all was good. I have no doubt that between Barry and Firestorm they could have defeated The Reverse Flash, but Eddie killed himself first. Eddie’s suicide is what created the singularity. AND with everything being the same timeline as before (for the most part) I think in killing himself and the singularity happening, he made the Reverse Flash the paradox he becomes in the comics. So, yeah if anyone is to blame I blame Eddie. His actions made everyone feel guilty, destroyed half the city, killed Ronnie, and made his many great grandson a flippin’ paradox that will come back again and again! Barry visiting Caitlin was a wonderful transaction. The Blame Game takes a run, but in all honestly, no one is to blame for Ronnie’s death, it was his choice to go that day. She still cares for him and helps him with Well’s Living Will. The confession is extraordinary! I began to ball my eyes out! Team Flash is working on the case full speed ahead and a FLASHlight to lead the way. Plan ready, The Flash easily takes down Atom Smasher, and gets a lead on real Bad Guy callin’ the shots, ZOOM. Henry Allen’s release from prison was all at once so wonderful and horribly disappointing. I so wanted him to become part of Team Flash, but that wish was sucked out from under my feet. It is nothing compared to Barry’s feelings on everything. I just hope he comes back regularly! I miss him already! The party it’s self was great, Prof. Stein’s Speech, Barry’s brief elation, Cisco getting his badge, the paper, even the cake. Finally, we end with all of Team Flash geeking out over the new suit Cisco made with the white in the background of the symbol, which is awesome! Star Labs is back in full life and color! All is great, even the new security system… and then Jay Garrick walks in without setting off an alarm! Lol A perfect ending to an awesome show! Cisco – Oh, ho, ho! Fear the Beard! Captain Singh – You are not getting a Badge Mister Ramon! Joe – Maybe his best friend. Cisco – Joe, believe me! I’ve Tried! Joe – I meant her. Cisco – You expecting trouble? Joe – Cops always expect trouble. This city I expect super, evil, flying monsters. The Flash – I got this. The Flash – I’m throwin’, You shootin’. Cisco – I would think this meta was really cool, if everything about him didn’t scare me to my core. Iris – Hey, so the hospital by the Flash Day Rally, the X-Ray machines all failed at once. Was that because of you? Cisco – I did not do anything that would cause that… I’m 92% sure… I’m gonna go make that a 100! Excuse me! Iris – If you keep getting ‘NO’ for an answer, Stop asking questions. Joe - *gasp* I say that! You quoting me to me! Caitlin – You carry a handkerchief now? What are you? 80? Caitlin – That light was perfect bait, what made you think of that? The Flash – You want me, you’re gonna have to catch me! Henry – My kid, the Superhero. Barry – I just feels like every time I win, I still lose. Iris – So people can’t just walking in and out of here without anyone noticing. Joe and Iris Father/daughter moments – Stop asking questions… Are you quoting me! Martin Stein naming Atom Smasher, and Cisco Hugging him! Jay Garrick Walking in to the newly secure Star Labs – FOR REAL! After Such a Fantastic Season 2 Premiere all we can do is move FORWARD!